By collaborating with smart organizations of all sizes, corporations drive productivity gains both for their customers and for their own professionals. It’s a win-win for all parties. The business world today is in a state of flux. New companies enter the ecosystem every day, bringing with them new technologies and business models, any one of which could transform an entire industry from the ground up. Most companies want to use this current of change to drive innovation. But the magic bullet is elusive as ever — the question is how best to drive innovation. For many, acquisition seems the only path to take through these disruptive forces of change. But I’d argue there is a different and more flexible way forward: PARTNERSHIP. Partners help a large organization pivot and adapt in today’s constantly changing business environment. Great outside partners help navigate rapidly changing waters. Those partners could include universities whose research expertise can be leveraged into game-changing R&D, accelerators that can source bleeding-edge innovations from all around the world, and agile startups that can experiment nimbly with new processes and ideas. By collaborating with smart organizations of all sizes, corporations drive productivity gains both for their customers and for their own professionals. It’s a win-win for all parties. In a good partnership, both partners should gain, emerging from the relationship better than they were before. To ensure this, it’s vital to define all parties’ goals clearly and upfront. According to a KPMG study, some of the most common goals for startups partnering with corporates are gaining access to the market (65%), raising capital (54%) or taking advantage of economies of scale (54%). Meanwhile universities pursuing outside partnerships may be seeking funding to replace public and government sources that have dried up in recent years. You’ll never know what any particular partner wants to get out of the relationship, though, unless you ask—every relationship is different. Corporations should do some soul-searching too and figure out what their strategic objectives for the partnership are beyond broadly promoting innovation. What unmet client needs will your partner help address? How will the partnership augment your company’s own internal resources and processes? Great partnerships are based on a solid business case, not irrational impulse. True partnerships depend on trust and faith, not just carefully worded contracts. You and your partner will be engaging with each other at a deeper level than a simple vendor/customer relationship, and that means you won’t just share goals and objectives but common values, too. Don’t hold back that deeper bond with too much red tape. As a 2016 Imaginatik/MassChallenge report on the state of startup/corporate collaboration puts it: “Lengthy up-front negotiations over IP concerns, access to talent, and expected time commitments may protect against exposure, but almost always lead to gridlock and failure.” Though it is important to define the terms of the relationship up front, a great partnership shouldn’t be micromanaged. Mutual understanding and trust should be your guide. This goes hand-in-hand with the trust element. You can never know at the beginning exactly how the relationship will develop—it continues to evolve as you and your partner learn more about each other. Many corporations will need to adapt their processes to suit the needs of their partners over time. For instance, some experts suggest creating special “fast-track” versions of processes like procurement and invoices specifically for startup partners, which often need to move faster than the large organizations with which you might be used to working. By contrast, university academic research often proceeds at a slower pace than corporations are used to. 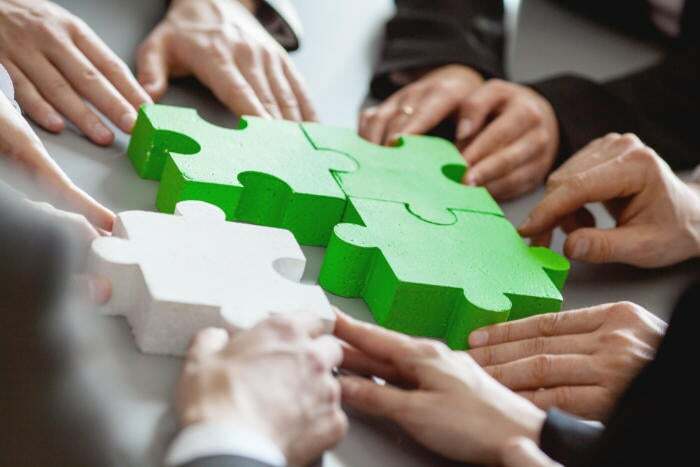 A study published in MIT Sloan Review suggests corporate partners define a specific timescale for each university engagement with an eye to encouraging more long-term instead of short-term involvement. Overall, the key is: adapt, adapt, adapt. You’ve invested in this partner, so do what it takes to make the relationship work for you. No matter how successful your partnership ends up being, you will have down days that cause you to question the relationship. That’s okay—that is part of the process. Heck, I certainly don’t know of a perfect personal relationship and a corporate/startup partnership is completely optional for both parties. Leverage some of that trust and faith to talk through issues with your partner and brainstorm possible solutions. Do they need more access to mentors and advocates in your organization? Closer connections to clients? Faster turnaround on invoicing? Do what you can to make it happen. It’s possible, of course, that the problems go deeper than that. Sometimes, a rough spot turns into a series of rough spots, which then turns into a sense that neither partner is getting the things out of this relationship that they wanted. That’s okay, too. Partnerships don’t have to last forever to be worthwhile—they can be for a season. Just remember to end things with your former partner on good terms: you never know when you might want to collaborate with them again in the future. There’s no way around it: building great partnerships takes a lot of time and effort. When it’s done right, however, the results speak for themselves. Partnerships are probably the most effective way a large organization can drive innovation and adapt to today’s changing tech landscape—getting there just takes a bit of dedication and faith.